It seems like this sentiment has been preached widely but yet I still see customers do this. In fact I’m writing this today because earlier this week I had a customer who’s Information Store Service, as well as the Exchange Transport Services, on Exchange 2013 would not start. Then earlier today a coworker actually did this in a lab which caused the same issue. Let’s start off with this, The Exchange Server Product Team performs Zero testing or validation on systems with IPv6 Disabled. So that right there should be a good indicator that you’re trailblazing on your own in the land of Exchange (bring a flashlight, it’s dark & scary). Let’s first talk about un-checking IPv6 on your NIC adapters. The problem with this is while the OS still thinks it can & should be using IPv6, the NIC is unable to do so which leads to communications issues. An easy way to test that your OS is still trying to use IPv6 is to ping localhost after you have unchecked IPv6 on your NIC & rebooted. You’re see that you still get an IPv6 response. I actually did a write-up about this topic on the Sysadmin community on Reddit awhile back which you can find here. As a side note, check out the Exchange community a colleague & I moderate on reddit here. Having Ipv6 unchecked when performing an Exchange 2013 install will result in a failed/incomplete installation which will result in having to perform a messy cleanup operation before you can continue. Microsoft Exchange Active Directory Topology Service may not start if the Exchange 2013 server is also a Domain Controller and IPv6 has been unchecked. The solution is to re-check it & reboot the server. Microsoft Exchange Transport Service as well as the Microsoft Exchange Frontend Transport, Microsoft Exchange Transport Submission, & Microsoft Exchange Transport Delivery services may not start if IPv6 has been unchecked on the NIC adapter of an Exchange 2013 Server. Microsoft Exchange Information Store Service may not start if IPv6 has been unchecked on an Exchange 2013 Server. I started this post saying that MS does no testing or validation for systems with IPv6 disabled in ANY WAY. However, some customers may actually have reasons for disabling Ipv6. I’m actually interested in hearing them but I also know some customers are very adamant about it. There actually was an issue in the past where Outlook Anywhere wouldn’t work in certain scenarios with IPv6 enabled but this should not be a problem with a fully updated Exchange Server (reference). I’ll also say that I personally have never had any issues with properly disabling IPv6 in the registry using this method. You basically add a DisabledComponents key to the registry with a value of 8 F’s (ffffffff) & then reboot the server. After this point IPv6 should be fully disabled. I’ve also spoken with a couple Microsoft Support Engineers who have also said that they have personally never seen any issues with disabling it this way; with Windows or Exchange. However, in my opinion you should have a good reason for doing so (and saying you don’t like IPv6 is NOT a good reason). Lastly, I’d like to add that if you’re utilizing iSCSI on your Exchange server, there should be no issues with unchecking IPv6 on your iSCSI NICs if you choose to do so. The article was specifically in relation to NICs connected to your production/public/MAPI networks. As usual, follow your SAN vendor’s best practices when configuring iSCSI NICs. 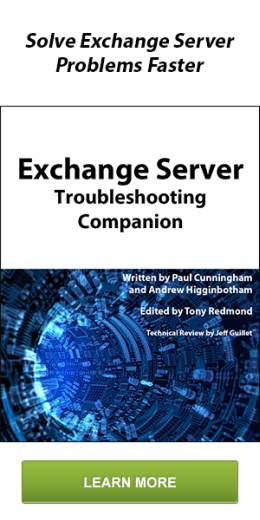 Also, here’s a shameless plug for the ExchangeServer subreddit (http://www.reddit.com/r/exchangeserver) which I help moderate (username=ashdrewness). There’s always people such as myself answering questions on there.